Love them or hate them, Google has added a new feature to their mapping, and I love it! You can now select bicycling directions on Google maps, similar to their, “by car”, “by walking” and “by public transportation” route methods. Users choose their starting and end points and Google does the rest of the work. Modifications to the route can be done easily by dragging a point along the route to different location on the map. 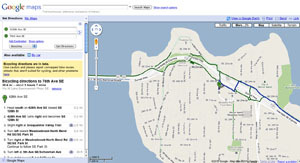 The bicycling map feature has a bicycling layer that indicates bike trails, bike lanes, and bike friendly roads. Google optimizes the route for bicycling and avoids hilly terrain when possible. However, it does not distinguish between paved bike trails and gravel bike trails so local knowledge is still helpful in determining which bike to use in getting from point A to point B. « The Inov-8 Roclite 295’s – Back in Black!